"Am going to cross Pacific on a wooden raft to support a theory that the South Sea islands were peopled from Peru. Will you come? ...Reply at once." That is how six brave and inquisitive men came to seek a dangerous path to test a scientific theory. 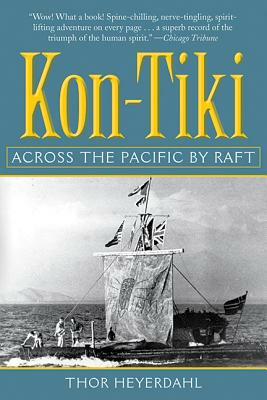 On a primitive raft made of forty-foot balsa logs and named "Kon-Tiki" in honor of a legendary sun king, Heyerdahl and five companions deliberately risked their lives to show that the ancient Peruvians could have made the 4,300-mile voyage to the Polynesian islands on a similar craft. On every page of this true chronicle--from the actual building of the raft through all the dangerous and comic adventures on the sea, to the spectacular crash-landing and the native islanders' hula dances--each reader will find a wholesome and spellbinding escape from the twenty-first century.